Buried beneath a slick layer of tourism marketing that has helped make Niagara Falls famous lies a hidden history. Its the remarkable history of power, and how events at the falls changed the world and made Niagara the Silicon Valley of the early 20th century. A new, first-of-a-kind book tells the riveting tale of how many of the great minds of science and industry harnessed the mighty Niagara to produce electricity. The true-to-life drama showcases stories of stunning innovations, tragedies and conflicts between those who had visions of generating endless power and people who fought to preserve Niagara Falls landscape. Its easy to take electricity for granted. We light the night, turn on our computers and heat our homes without thought. But the availability of electricity is only a century old, and the technology to carry it across the nation was developed right here at Niagara Falls. 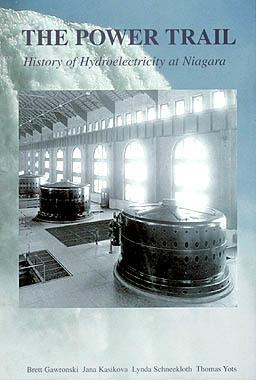 The Power Trail: History of Hydroelectricity at Niagara Falls integrates an engaging text with nearly 250 photos  some never before published  to piece together the obscure story of how Niagara revolutionized electrical production. But the book doesnt only showcase the impressive power plants that are temples to the Industrial Revolution. It also focuses on the colorful characters who played key roles in the unfolding drama. The people profiled range from Thomas Edison and George Westinghouse, to Nicola Tesla, Jacob Schoellkopf and the Tuscarora Chiefs. If some early industrialists had their way, there would be no water flowing over Niagara Falls today. As much as 75% of the water from the Niagara River is withdrawn for power production even before it reaches Niagara Falls. Enough water goes through the power plant to give all U.S. citizens a glass of water every 12 seconds. Written by Brett Gawronski, Jana Kasikova, Lynda Schneekloth and Thomas Yots, the book recounts the stunning collapse of the Schoellkopf Power Plant in 1956. and many other milestone events.